Almost every home I have been in has this in common - the cleaning products are stored under the kitchen sink. Depending on the size of your house, maybe you have a separate closet where these are stored and that’s great! Most of us don’t have the luxury of extra storage space so under the sink is where they have to live. The trick is, just like everything else you own, avoid overload. You do not...are you listening...you do not need 17 bottles of Windex. I have one and I buy the big refill bottle from Costco so I’m not constantly having to buy more Windex. I have a cleaning obsession in addition to organizing so I go through a lot of Windex apparently. The second trick is to contain as many of the items you’re storing under there as possible. 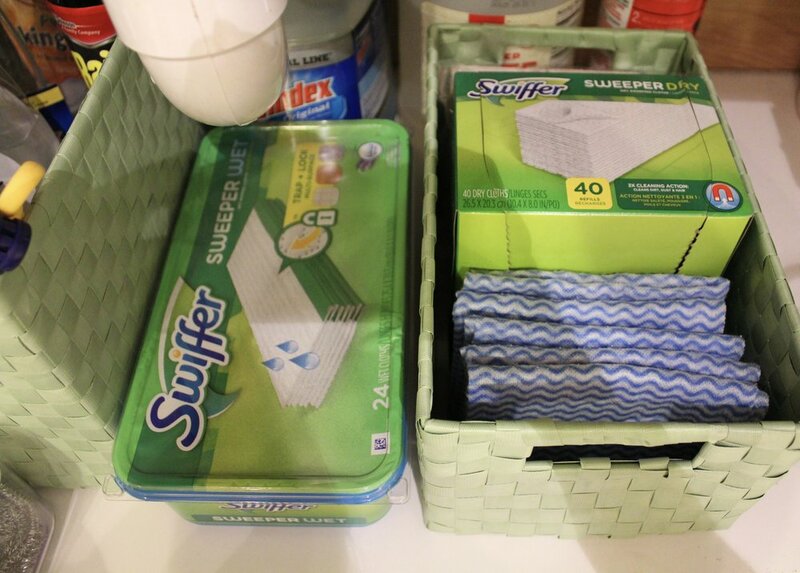 This makes it SO easy to clean the base of the cabinet and also move items from room to room. You’re going to have to do a bit of homework if you’re looking to purchase containers as you are working with a constricted space. Pull out the measuring tape and write down the height and the width before shopping. The pipes will have to be taken into the consideration as well as you don’t want to place anything too close to them. If you have an odd shaped space you’re working with, a lazy Susan would actually be your best bet here! 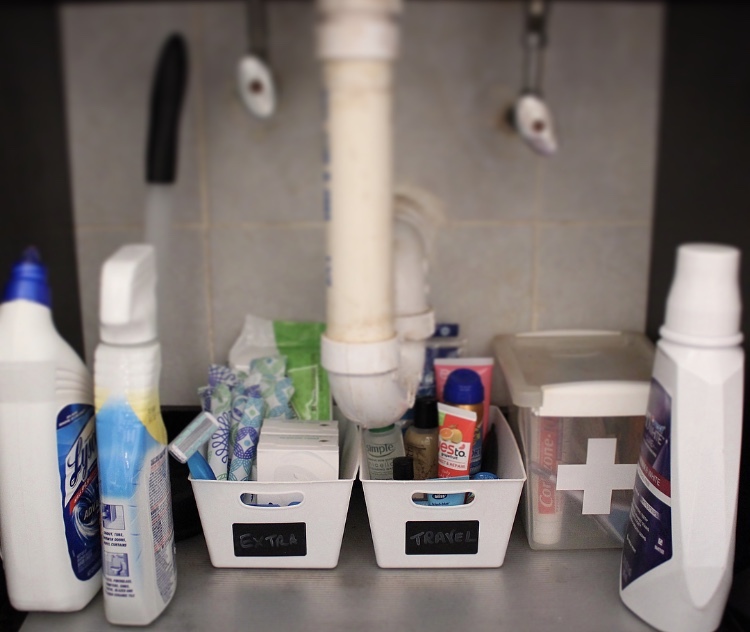 The Container Store has a ton of products perfect for organizing under the sink! Check them out here, here and here. I’m all about clutter free countertops so I actually use the inside of one of the doors to hold my paper towels. 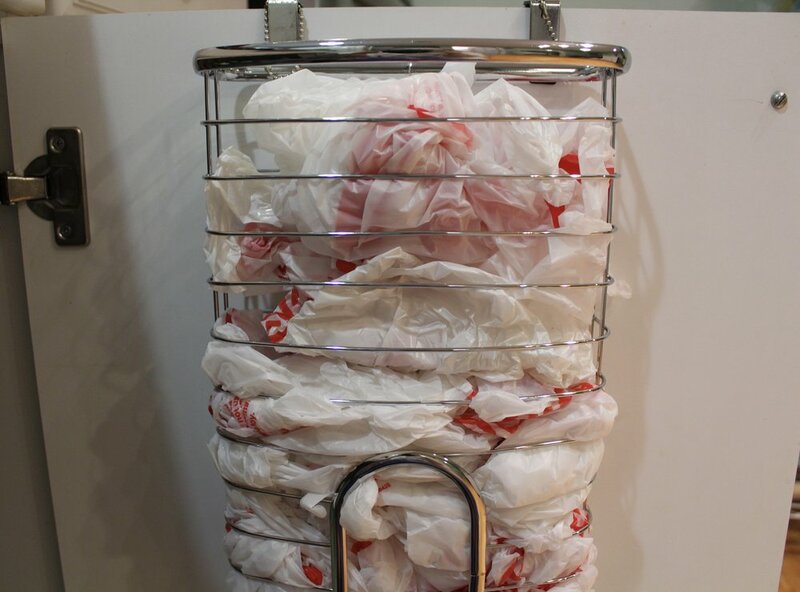 While I definitely do not hoard plastic bags - and neither should you - it is always good to have a few on hand so I use the other door for that purpose. Over the door caddies are an option as well for additional storage space. 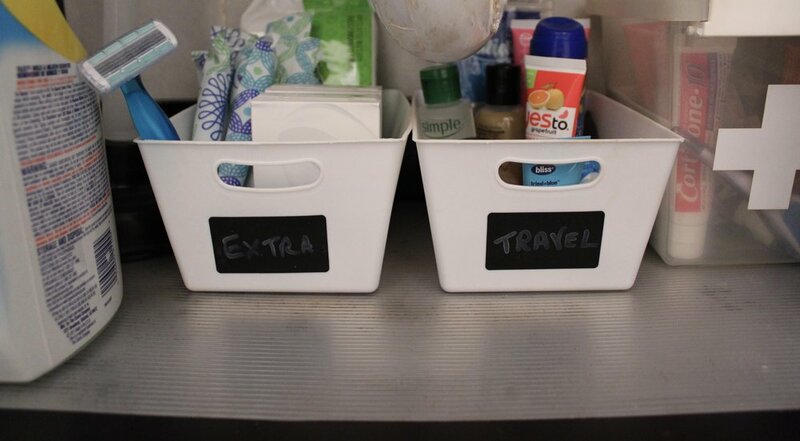 Use them to hold the sink/dishwashing products (soap refill, sponges, pods) for easy access while you’re standing doing the dishes. I’m all about making life as easy as possible for ya! Now what about the bathroom? Generally, you have even less space to work with here but don’t let it get you down. Not to sound like a broken record but don’t hold on to more items than you need! SO many times when I’m organizing someone’s space, I find multiple bottles of the same product and the reasoning is almost always the same: well, you see Mary, I couldn’t locate the original so then I had to go and buy more. We’re going to stop this cycle of madness (and waste) once and for all! Another pet peeve I have about what gets thrown under here is that many people use it for storage for everyday products such as cotton balls and makeup, for example. Do you really want to be bending down day after day to get at these things? These items are much better at eye level so think medicine cabinet or shelves that are higher up. 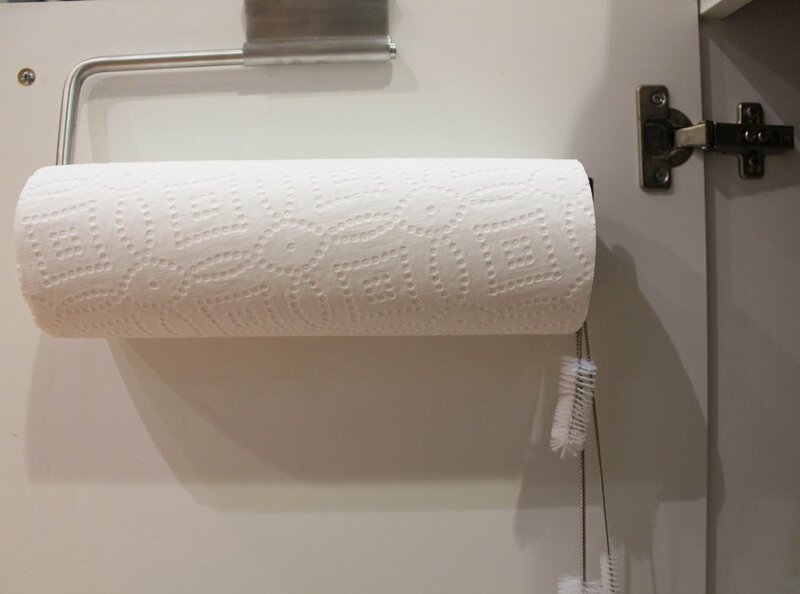 Also, I see a lot of ideas on Pinterest regarding storing extra towels or washcloths under the bathroom sink. This is a closed off space in the bathroom which can get a little damp (I won’t use the M word and you shouldn’t around me either unless you want to get on my bad side!). I prefer fabric to breathe so either I leave these in a linen closet outside of the bathroom or roll up a couple extras and leave them out as a nice display (think spa style). Now, I’m fortunate to have space to store most of my backup products away from the bathroom but I like to have a few of each within reach. I use a bin to corral a couple extra bars of soap, razors, floss, and - sorry, guys - tampons. I also travel quite a bit so use a matching bin as a storage spot for any mini bottles I snag from hotel rooms or samples from stores. This way, when I pack, I just pull out the bin, place it on the sink, and pick out what I need. This is also where I store a small first aid box - I find the smaller the container, the less items I can fit in it which results in holding onto only the necessities. There’s just enough space left for a bulky bottle of mouthwash that won't fit in the medicine cabinet, a plunger, and cleaners specific to the bathroom.